By adding linked text buttons, you can let customers jump straight to a page on your website — or any other site. 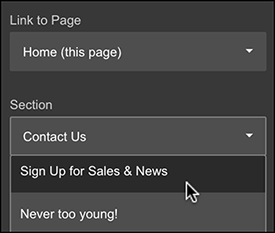 For example, if you want to promote your newsletter, link a "subscribe" button to your email sign-up form. As one of the first things visitors see, such "action buttons" can boost the odds of visitors responding. In the Sections panel, click Header. In the Header panel's Content section, click Action Button. Click the toggle next to the Show Action Button to turn it on. Type in what you want the Button Label to say. Note: The shorter your label, the more likely it'll be read. Shoot for no more than 25 characters. 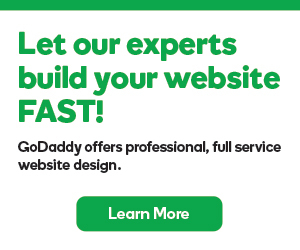 Click the Link to Page arrow to link the button to a page on your site or Another Website. 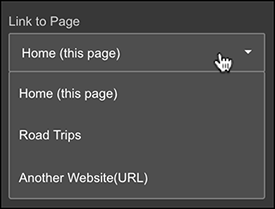 If you selected the Home page, you also can click the Section arrow to link to a particular section in the page. Note: This option's only available for the Home page.